Capitals head coach Todd Reirden stated that the team has yet to make a decision on which game captain Alex Ovechkin will serve his suspension for skipping 2019 NHL All-Star Weekend in San Jose this upcoming weekend to take full advantage of the team’s bye week​. He will either serve the suspension at the Toronto Maple Leafs tomorrow or vs. the Calgary Flames on February 1, the Capitals’ first game after the bye​ wee​k. Reirden said the team will make a decision on that prior to tomorrow’s game at the Maple Leafs. Even if he doesn’t play in Toronto on Wednesday, he will travel with the Capitals. Caps coach Todd Reirden said no decision yet on whether Alex Ovechkin will sit out (mandated for missing All-Star Game) at Toronto tomorrow or vs. Calgary on Feb. 1. Said they’ll continue to evaluate decision after game tonight. Ovechkin will go with Caps to Toronto regardless. Reirden hinted that there’s a possibility that goaltender Braden Holtby could start both games on the back-to-back against the Sharks and Maple Leafs. Reirden said Caps still haven’t made a decision on which game Ovechkin will miss, but he’s going to Toronto tomorrow regardless. Also, Reirden was noncommittal on starting goalie for tomorrow. Think there’s a slight chance Holtby starts both games. Center Evgeny Kuznetsov bumped back up to the second-line center spot while center Lars Eller returned in his normal spot, centering the third-line. Caps coach Todd Reirden said Evgeny Kuznetsov goes back up to 2nd line tonight with Vrana and Wilson and Eller back to third with Jaskin and Connolly. Defenseman Brooks Orpik will play against the Sharks tonight after taking a maintenance day on Monday. Brooks Orpik said he’ll play tonight. Maintenance day yesterday was precautionary with three games in four days and coming back recently from knee surgery. Forward Devante Smith-Pelly, center Nic Dowd, and defenseman Madison Bowey will be the scratches for the Capitals against San Jose tonight. Seems that DSP, Dowd and Bowey are the scratches tonight. The Sharks did not hold a morning skate as they are playing the second game of a back-to-back against the Capitals after falling to the Florida Panthers 6-2 on Monday night. 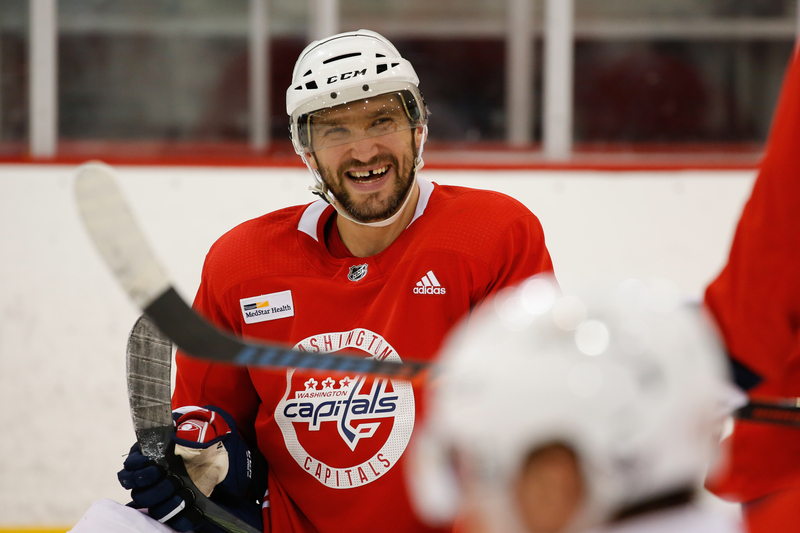 This entry was posted in Daily Report, Injuries, Lineups, Morning Skate, News, Washington Capitals and tagged Alex Ovechkin, Braden Holtby, Brooks Orpik, Christian Djoos, Evgeny Kuznetsov, Harrison Brown, Morning Skate, News, Todd Reirden, Washington Capitals. Bookmark the permalink.